WITH mortgage rates inching higher, some borrowers might want to consider a lock-in agreement, which freezes the terms of a loan while it is being processed, potentially saving borrowers thousands of dollars over the life of the mortgage. This guarantee may be especially important for those who are refinancing, where even a quarter of a percentage point could skew a borrower’s calculations and make a refinancing less financially desirable, said Keith T. Gumbinger, a vice president of HSH.com a financial publisher in Pompton Plains, N.J.
Rates for the 30-year fixed-rate mortgage averaged 3.95 percent nationwide in March, up from 3.89 percent in February, according to Freddie Mac, though that is still significantly lower than the 4.84 average rate in March 2011. 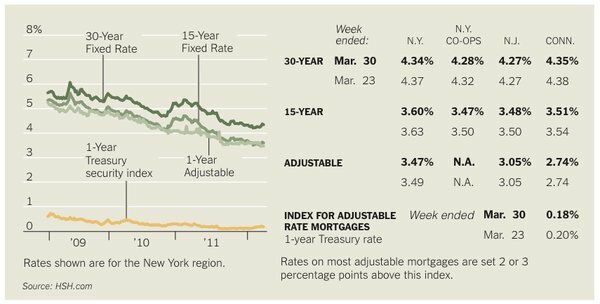 The average rate was 3.98 percent on Thursday, versus 3.99 percent the week before. Rate lock-ins can provide buyers with some peace of mind, not to mention one less thing to think about in an otherwise onerous application process. Lenders typically will give loan rate guarantee agreements when a borrower has a purchase agreement, but a few will provide them to those who are preapproved for a mortgage, said Rick Allen, the chief operating officer of Mortgage Marvel, an online site. While shopping for a mortgage lender, Mr. Allen suggests inquiring about loan locks, too. “Get a copy of the rate lock agreement,” he said, noting that this would help borrowers better understand how the process works. The cost of reserving an interest rate depends both on the duration of the lock and the amount of the loan. “The longer the lock, the more costly it is,” said Mark Lazar, an owner of Allied Financial Mortgage in River Edge, N.J. Most locks are for 30, 45 or 60 days, but some lenders will go as long as six months. Most lenders offer some version of a free lock, Mr. Gumbinger said, though it may be only for 30 days. Others charge points — or fractions thereof — based on the loan size, which could amount to several hundred dollars. (A point is equal to 1 percent of the loan amount.) Sometimes these charges are refundable at closing, Mr. Gumbinger said.